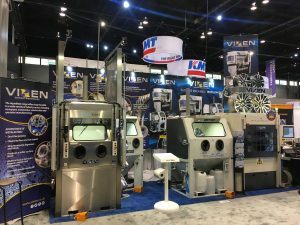 This year Vixen exhibited at the IMTS Show in Chicago and it was a huge success! The International Manufacturing Technology Show is one of the biggest in the US and brought in crowds worldwide to view the magnificent machinery on display. I had the privilege to join the Vixen team on their stand to speak to new and existing customers. Throughout the show it was extremely busy and lots of demonstrations were given. You can see below some great parts that where processed in one of the Aquablast machines. At the show Vixen took along a fully stainless steel Aquablast cube machine, which is perfect for production lines as it features a pass through facility, an Aquablast 915 which is one of the standard Aquablast machines, Aqua Wheelblaster which was designed purely for the refurbishment of alloy wheels. Vixen also took a long the all new Vertical Wheel Lathe which was launched at the show, this machine has laser probe technology to scan the original wheel every time. 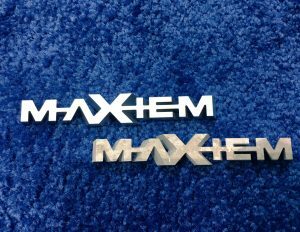 By the last day every machine on the stand was sold and it was a huge success! Not only that, but Vixen gained some great worldwide relationships with potential and existing customers. Whilst I was there I had time to quickly have a walk around the rest of the show and seen the amazing machinery that was on display. 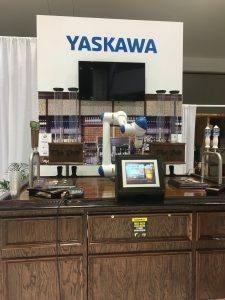 One of the stands which caught everyone’s eye was the beer pulling robot!